At Barrier Island Station Duck, we offer excellent lodging accommodations. Click here to check availability or to rent your week. The “A” side has a king bed in the master bedroom and a queen size sofabed in the living room. The “A” side has one and a half bathrooms. The master bath has a shower and jetted tub. There is also a half bath in the hallway. The “A” side includes a full kitchen (stove and oven, large refrigerator with ice maker, dishwasher, microwave, toaster, blender, coffee maker, pots and pans, cooking utensils and place settings for 4 people). Unit has 1 TV. The “B” side has a queen bed in the master bedroom and a queen size sleeper sofa in the living room. The “B” side’s partial kitchen (kitchenette) has an apartment size refrigerator with ice trays, no dishwasher, 2 burner cooktop (no oven), microwave oven, toaster, blender, coffee maker, pots and pans, cooking utensils and place settings for 4 people. The “B” side has one full bath with tub/shower. Unit has 1 TV. Both the “A” side and the “B” side have decks. Located in the entry foyer, the two condos share a washer and dryer. Click here to check availability or to rent your Outer Banks Duck week. Nothing available at Duck right now? 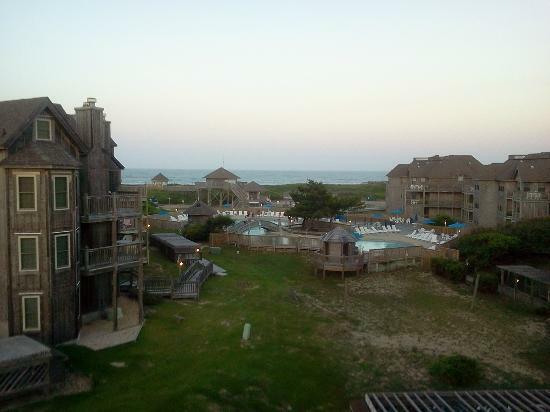 We also offer weeks at Barrier Island Station Kitty Hawk Resort, click here to check availability in Kitty Hawk. Tucked away in the quaint Outer Banks village of Duck, Barrier Island Station at Duck is an escape to North Carolina’s wild and serene shores. Enjoy the resort’s indoor and outdoor pools, tennis, beach volleyball and basketball courts, and a recreational center that offers planned and spontaneous activities, including a children’s pool, indoor water aerobics, sauna, workout rooms, a game room and a playground. Barrier Island Station Duck Outer Banks is an oceanfront resort. Just a short walk puts you on the expansive and uncrowded beach, where a stroll along the sands or a swim in the Atlantic provide a soothing release. Fishing, golfing and boating are available to enhance your memorable vacation. The area’s shopping, dining and live entertainment venues make Barrier Island Station Duck an alluring vacation destination. When available, we offer 1BR “A” and 1BR “B” condo vacation rentals. Prices are $599 for the “A” side, $549 for the “B” side, or $1099 for the entire 2BR lockoff unit (on request). Compare at $900 for the “A” side and $800 for the “B” side, or $1500 total for the two sides, plus 12% tax (source: Nikki at the resort). The prices shown are the TOTAL prices. There are NO additional charges (such as sales or lodging taxes, cleaning fees, deposits, booking fees, etc.). The price you see is the price you pay! The Outer Banks hosts a multitude of activities. Guests may choose among all types of water, land and air excursions. Hunting, fishing and hang gliding are favorite tourist activities. Take a scenic drive along the Outer Banks, and you will find abundant nature, history, as well as shops and restaurants. Being a coastal location, fresh seafood is always available at local restaurants. Additionally, the 30 miles of beaches in the Outer Banks provide a plethora of activities such as swimming, beachcombing, scuba and wreck diving, parasailing, boating, windsurfing and more. Fishing is also a popular activity in the Outer Banks. Guests may also enjoy hang gliding, bird watching, air tours, pontoon boat rides and more in the area.